Reginald Ingraham Gallery proudly presents a new exhibition of works by Umar Rashid. In A Smile That Aint A Smile But Teeth, artist, performer, and storyteller, Umar Rashid opens his first solo show under his aforementioned birth name at the Reginald Ingraham Gallery. 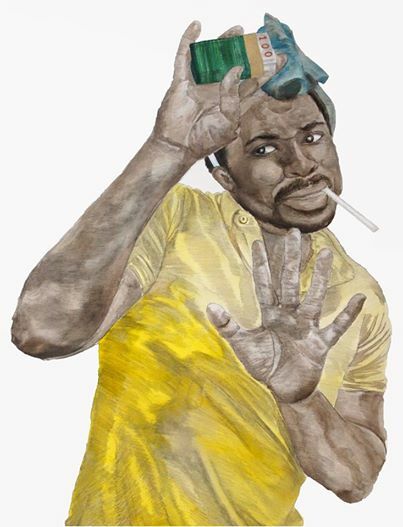 In the art world, Rashid is better known as “Frohawk Two Feathers” – his nom-de-plum and alter ego. This Homeric and Tolkien-esque raconteur is known for reweaving and reinventing a master narrative based on the supposition that France and England had united as “Frengland.” In his painted and sculpted saga, Two Feathers invites viewers through tales of woe and into bloody battles, introduces them to traitorous heroes and lost loves, and amuses them with his wit, humor, and biting sense of irony. Umar Rashid, (Frohawk Two Feathers) has had recent solo museum exhibitions at the Museum of Contemporary Art, Denver Co, Nevada Museum of Art, Wellin Museum of Art, and the Visual Arts Center of New Jersey. Umar was born in Chicago, Illinois and lives and works in Los Angeles, CA. This will be his first show at Reginald Ingraham Gallery.